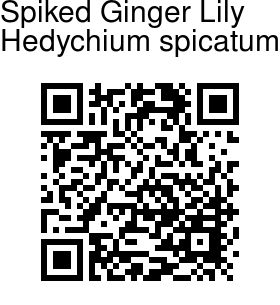 Spiked Ginger Lily is a smallish hardy ginger, growing to around 1-1.5 m, with leafy stems. Flowers are fragrant, white with an orange-red base, appearing in a dense spike, 15-25 cm, at the top of the stem. Flower tube is 5-6.5 cm long, much longer than the sepal cup, with white narrow petals spreading outwards. Lip is white with two elliptic lobes with an orange base. Filaments of the stamens are red. Leaves are oblong, up to a foot long and 4-12 cm broad, much like Haldi leaves. A perfume Abeer is obtained from the root stock. 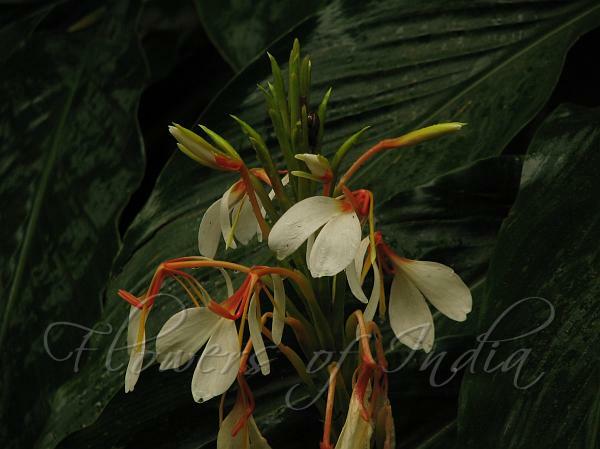 Spiked Ginger Lily is found from Himachal Pradesh to Arunachal Pradesh, at altitudes of 1800-2800 m. Flowering: July-August. Medicinal uses: Rootstocks are used in medicine.